Q: Do I wish I’d started writing fiction earlier in life? A: I started dreaming about writing chapter books when I was reading Hardy Boys mysteries in second grade. But I didn’t publish my first novel until I was 51 years old. Flag me for rationalizing but, looking back, I think things happened the way they should have. The truth is, I never lost sight of my dream. I just took a detour: journalism. Without it, I doubt I ever would have written any serious fiction (wildly assuming, of course, that you consider my made-up stuff serious). Reporting and writing non-fiction taught me a lot that I use to tell my imagined stories: Discipline. Deadlines. Organization. Research. Word economy. Observation (not just sight and hearing, but smell and taste and touch). Dialogue. Narrative. And respect for the wishes of readers who would prefer to have me blow up a car than ponder the meaning of life (or, for that matter, hockey). More important, I spent a lot of years living before I attempted my debut, STARVATION LAKE. There’s no way I could have written a coherent novel with the slightest trace of maturity when I was in my 20s or 30s. Not to mention that I was a little busy helping Pam bring up our three children. I did a lot of fantasizing about the novel-writing, though. My late pal, the writer Brian Doyle, once told me that really all I wanted was to sign books at my first reading. It was a jab; Doyle didn’t think I was serious about fiction. Years later, he wrote me a long note about how the both of us had become real writers by writing thousands and thousands of words. My journalism career is winding down after nearly 39 years. I look at that as an opportunity to crank up the truly fake news of my novels, using all the skills I learned writing the non-fiction stories I’ve written since I joined the staff of the Brighton Argus in 1979. For the record, I have yet to blow up a car in any of my novels. But I’m writing a new one, so who knows? P.S. 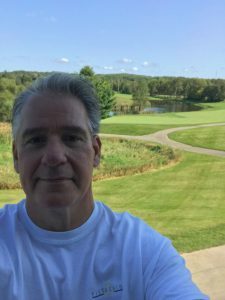 I’m writing this from a golf course near Cadillac, Mich., on my way to an annual boys weekend Up North.